It should have come gracefully to an end 31st December 2016, when I’d reached the 253 mark. I managed that, but I just can’t say goodbye. I’ve tried a 6 month trial separation, but its no good. 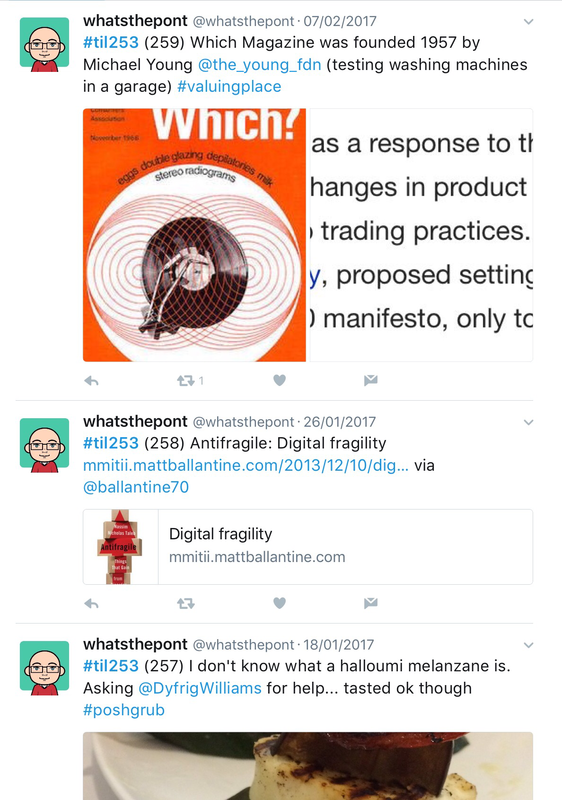 I want #TiL253 back in my life (and I hope it wants me). So Why? and What Happens Next? There are two specific reasons for keeping on with #TiL253. Second. It will force me into doing something with the information I’ve collected. I did promise to do this, but never actually got around to it. My plan is to do something with SenseMaker, and share the results around if anyone is interested. A public commitment like this should get me motivated to have something up and running by August (2017). All the details of why #TiL253 started are below. I suppose I’ve now gone from and experiment into implementation. Original Post. This is an Experiment. I’m having a go at recording some of the interesting things that cross my path. It’s called #TiL253. Today I Learned (TiL), I’ll explain the # and the 253 in a minute. This page was posted on the 31st December 2015.